Outdoor apparel and footwear has to be water-resistant. In rough terrain and difficult weather conditions, it’s the only way to ensure maximum comfort – especially when the rain doesn’t let up. 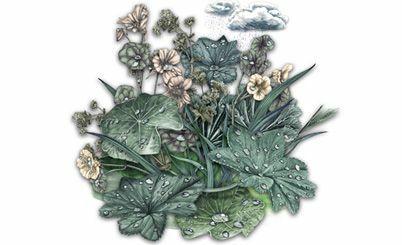 There are a variety of waterproofing methods for treating the surfaces of outdoor textiles. PFC continues to be a widely used substance for waterproofing. However, because these chemicals place a major burden on the environment, we at VAUDE are making every effort to use alternatives for waterproofing our products. Specially developed and, above all, more compatible technologies are enabling us to eliminate the use of PFC in the majority of the collection. 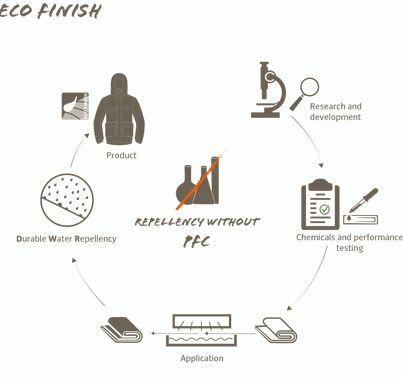 In order to help you recognize the water-repellent and waterproof products that have been treated with eco-friendly waterproofing, we have given them the Eco Finish label. All items bearing this label are 100 % PFC-free for eco-friendly water resistance. 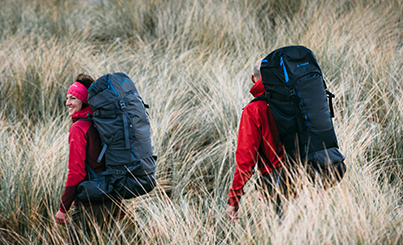 95 % of all VAUDE garments are already completely PFC-free. With the launch of the 2018 Summer Collection, we are finally increasing this value to 100 %. PFC and PFAS are fluorocarbons – perfluorinated and polyfluorinated chemical compounds – that were invented in the 1960s and have been widely used since then, particularly for coating textiles. This treatment provides dirt, oil and water-repellency. But PFC is also used in other branches of industry. Unfortunately, it was only in retrospect that fluorocarbons were discovered to be dangerous for the environment and for human health. Perfluorooctanoic acid (PFOA) in particular is a strongly criticized substance. One of the reasons for this is that it is virtually non-biodegradable. PFOA has already been found in glaciers on all continents, in the blood of polar bears and in our local drinking water. Traces of PFOA can even be found in breast milk. At VAUDE, we have therefore decided to eliminate the use of these substances altogether. Despite intensive research, no alternative to PFC has yet been found for successfully making apparel oil-repellent. However, we believe that high-quality outdoor products don’t necessarily need this feature, and are therefore eliminating the substance from our manufacturing processes completely. We aim to achieve this goal for the entire product range by 2020 at the latest. Water-repellent properties, on the other hand, are imperative. Effective waterproofing is an important part of this process. Without waterproofing, even when a membrane is used, the outer surface of the fabric absorbs water which can make your clothing feel clammy. Waterproofing is achieved with the help of Durable Water Repellency (DWR), which is used to treat textile surfaces: Moisture can no longer be absorbed by the fabric, but simply beads up on the outer surface. In the past, there were hardly any equivalent alternatives to PFC for this purpose, but today, thanks to modern technologies, it’s a different story. Fluorocarbons are no longer required for waterproofing treatments. VAUDE uses a variety of different technologies for waterproofing that make its materials eco-friendly and water resistant. Our tests have shown that different waterproofing methods are optimal for different materials. That's why we have partnerships with several different suppliers of a variety of technologies.